This festive season add sparkle to your celebrations with our buzzing ambience, festive food, tasty tipples and enough cheer to last well into 2020. From lunches to dinners, banquets to sensational private parties, we invite you to indulge in a feast of festivity. And rest assured, we’ll take care of every last detail to make it stress-free, fun-filled and entirely unforgettable. When Denham Grove throws a party, there are no half measures. Enjoy a delicious 3-course sumptuous seated dinner, then jingle all the way into the early hours with our merry mix of music. We’ll even supply crackers, hats and goodies to get everyone in the mood. With years of experience we make our venue the perfect place to party. So, dress for the occasion, bring friends or colleagues and join other partygoers at one of our extravaganzas through November-December 2019. Really get the party started with our ever-popular tribute nights. This year we will take you back as you party the night away with our fantastic Diana Ross and George Michael acts. Everything is laid on: the lights, the decorations, the dinner, and even the floor-filling music! With years of experience we make our venue the perfect place to party. Enjoy a festive cocktail when you arrive, a delicious 3 course dinner and half bottle of wine. Then finish the evening off with our resident DJ. With just 4 dates available, these tribute evenings really aren’t one to miss! 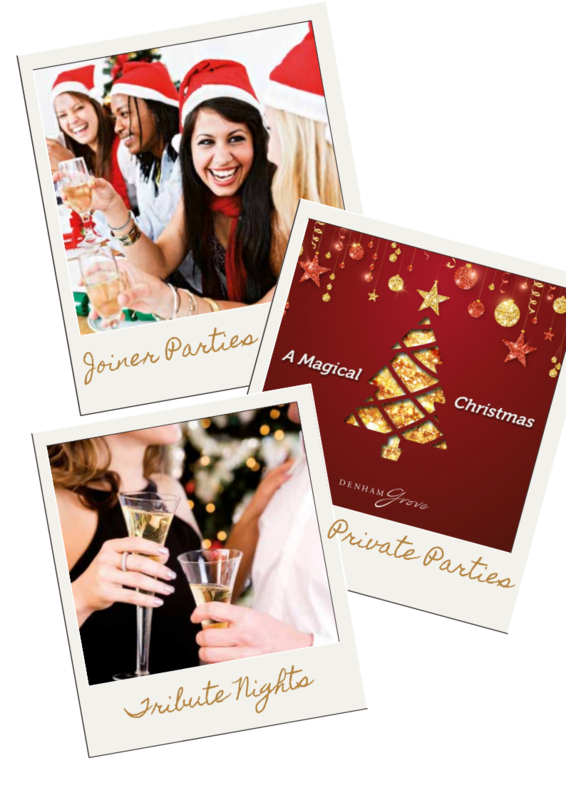 Why not let us arrange a night you’ll never forget in the festive surroundings of Denham Grove? 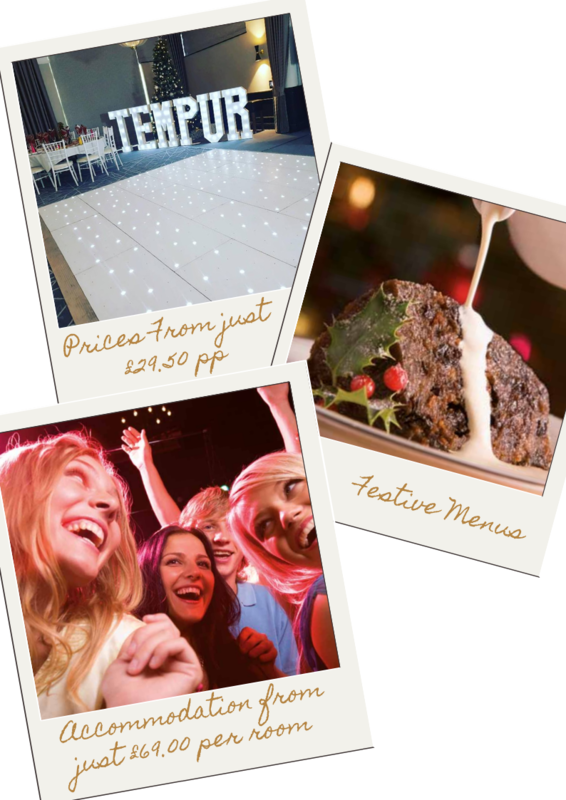 Revel in the lights and decorations, sample festive flavours, and turn back the years on the dance-floor. From a festive cocktail on arrival, the hats, crackers and goodies, to a delicious 3-course dinner with half bottle of wine per person, we cater to every whim making sure you and your guests enjoy the wonder of the season. Then dance the night away to all your favourite hits! Why not add a selection of our fantastic extras such as our sumptuous cheese platters and buckets of beers on the table to really treat everyone this Christmas? On behalf of our team, we look forward to making it a Merry Christmas and a Happy New Year.